Note: Other includes hydroelectric, landfill gas, wood/wood waste biomass, petroleum liquids, and other waste biomass. Every month, EIA collects information about all utility-scale power plants in the United States, including planned projects reported by developers. 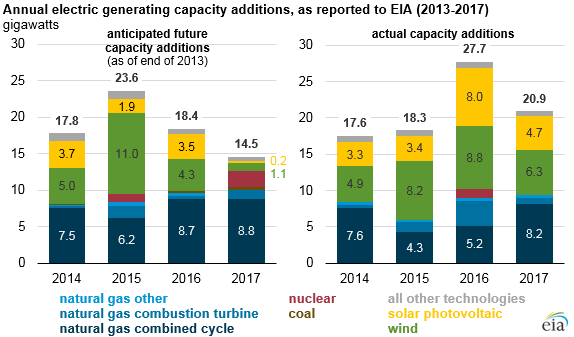 EIA relies on information reported by developers and plant owners to track electricity generating capacity, upcoming retirements, and planned new capacity on a monthly basis. In EIA's Annual Electric Generator Report (EIA-860), power plant developers told EIA they planned to install 25.1 gigawatts (GW) of generating capacity in the upcoming year. Of this amount, 19.7 GW (78%) came online last year as scheduled. 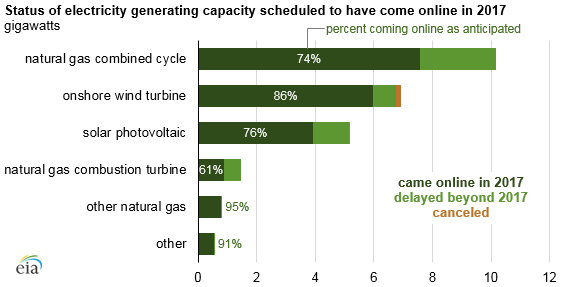 About 5.3 GW of planned capacity were delayed into 2018 or later years. Few projects were canceled. About 809 megawatts (MW) of the capacity added in 2017 was not anticipated at the end of 2016; most of these plants (660 MW) were solar photovoltaic (PV) projects. Another 410 MW came online earlier than reported. The Annual Electric Generator Report collects data on the status of existing electric generating plants in the United States, along with proposed generating units scheduled for initial commercial operation within the next 5 years for most technologies and 10 years for coal and nuclear units. The monthly version of this survey, the Preliminary Monthly Electric Generator Inventory (EIA-860M), collects data on the status of proposed new generators scheduled to come online within the next 12 months. This monthly survey collection began in 2005. Both surveys cover utility-scale generators, which are those with nameplate capacities of one megawatt or greater. Natural gas combined-cycle plants accounted for 10.1 GW, or 40%, of the total proposed capacity that had been scheduled to come online in 2017. Of this amount, 7.5 GW came online within the year, and 2.6 GW were delayed until 2018. Renewable energy technologies—wind and solar (PV) generation—represented the next two largest groups of capacity additions in 2017. Of the 6.9 GW of onshore wind turbines scheduled to come online in 2017, 86% came online as scheduled in 2017; 792 megawatts (MW) were delayed and 155 MW were canceled. About 3.9 GW of utility-scale solar photovoltaic capacity were completed on schedule last year, and 1.2 GW were delayed to 2018 or beyond. Near-term expectations for projects coming online tend to be more accurate than longer term expectations for projects coming online. The information reported to EIA at the end of 2013 for what would be installed in the subsequent year was very similar to what was actually installed in 2014, with a difference of only 200 MW, or about 1% of the total. In later years, however, actual installations differed from the end-of-2013 expectations, as more than 10 GW of capacity came online during 2014 through 2017 that was not anticipated in 2013 EIA-860 reporting. Notable capacity differences in some technologies such as wind and solar can be attributed to changes in subsidies, faster installation times, and decreasing costs. These factors influenced both the timing and magnitude of wind and solar capacity additions. Nuclear capacity additions also faced delays: at the end of 2013, the Watts Bar Unit 2 plant in Tennessee was expected to come online in 2015, and two other nuclear plants were expected to come online in 2017. In reality, Watts Bar Unit 2 came online in June 2016, and the other two projects (Vogtle Units 3 and 4 in Georgia and Virgil C. Summer Units 2 and 3 in South Carolina) were delayed indefinitely.